To all the wonderful folks at LIGRR ... Thank you!! One year ago, May 2006, we lost one of our Newfoundland's, Kodi at 5 yrs of age. Our other Newf, Riley (4 yrs old) was devastated! All he did was lay around and whimper. We decided at that point to look into adopting a Golden Retriever, since we had owned one for 10 years before the Newfs. I searched online and found LIGRR, filled out an application, passed our home interview and then waited and waited. Each new Golden face I saw added to their website, I fell in love with. Melanie had the patience of a saint with all my e-mails I sent. 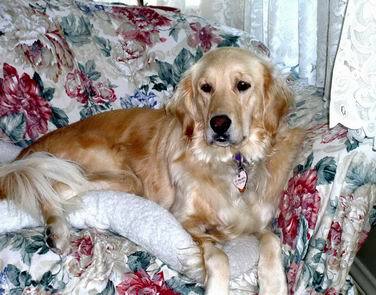 September 2006, the call came that there was a Golden, named Minnie from a Brooklyn shelter that had been brought out to Jericho Animal Hospital and would we like to meet her. We were forewarned that she was a submissive and most likely would "pee" when we met her. Also, we were told that Riley was the determining factor as to whether we could adopt her if we liked her. The day we met her, she DID NOT pee and was so happy to see Riley. Riley, however, decided that his job was to "mark" every pole and bush instead of paying attention to her. She play bowed and finally got his attention. That did it!!!! We were going to bring her home with us. On the way home we changed her name from Minnie to Maggie (aka Maggie Moo, Mags, Mag Pie and Pretty Girl). The first few days here, she did pee on our carpeting, so off to the vet we went. Maggie was given a clean bill of health and put on DES for bladder control. She's gone from 41 lbs to 73 lbs. She's so hyper and active, we don't have a clue as to how she gained so much. Maggie was the best thing for Riley. They've become best buddies. They sleep together, play together and between the both of them, we've got a built in security system. 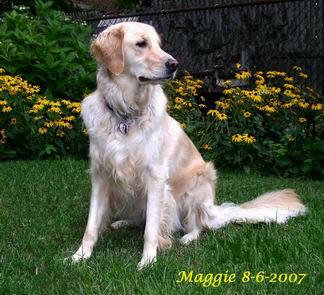 Thank you LIGRR for giving us the opportunity to adopt our Maggie. Maggie-thanks LIGRR for giving me a big brother to play with! Newfy hugs from Riley for giving him a "golden newf" sister!